Q: According to reports, the DPRK announced the reopening of the Panmunjom hotline from this afternoon and would discuss sending delegation to participate in Pyeongchang Winter Olympics with the ROK. What's China's comment on this? A: We have seen relevant reports. Like what I said yesterday, China welcomes and supports the DPRK and the ROK in taking this opportunity of Pyeongchang Winter Olympics to make concrete effort to improve their relations, ease tensions on the Peninsula and realize the denuclearization of the Peninsula. 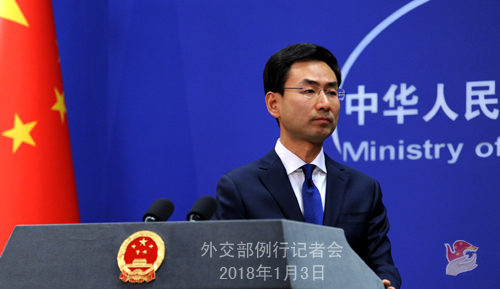 China maintains that relevant parties of the Korean Peninsula issue should seize the positive tendency in the situation on the Peninsula and work for the shared goal. 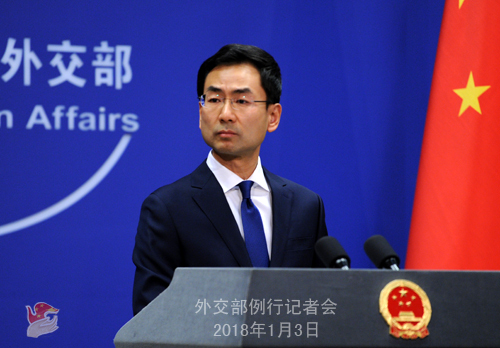 China is willing to continue to play a positive and constructive role in bringing the issue back to the right track of peaceful settlement through dialogue and consultation and achieving the denuclearization and long-term peace and tranquility of the Peninsula. Q: In response to the DPRK supreme leader Kim Jung-on's New Year speech, US President Donald Trump said on Twitter that his nuclear button is much bigger and more powerful than Kim's. Separately, US Ambassador to the United Nations Nikkei Haley said that the US will not take any talks between the DPRK and the ROK seriously if they did not do anything to get the DPRK to give up its nuclear weapons. And today, the DPRK just declared it would reopen the cross-border communications hot-line with the ROK. What is China's comment on these above-mentioned remarks of the US side? A: I took a similar question yesterday. At present, the situation on the Peninsula remains complex and sensitive. We hope all relevant parties can exercise restraint and speak and act in a way that will help ease tension and resume peace talks as soon as possible. Like what I said yesterday, the Korean Peninsula nuclear issue is a security issue in essence, and its crux is the contradiction between the DPRK and the US. We hope that the two sides, as parties directly concerned, can resume dialogue and build mutual trust at an early date rather than provoke and call out each other. We hope all relevant parties can seize the positive tendency of the situation on the Peninsula and work for the shared goal in an effort to bring the issue back to the right track of peaceful settlement through dialogue and consultation at the end. Q: Indian reports said that in late December, Chinese soldiers rolled building machines up to 200 meters into Arunachal Pradesh, and they were confronted by Indian soldiers. Do you have any comment? A: First, I need to point out that China's position on the China-India boundary issue is consistent and clear, and we have never recognized the so-called "Arunachal Pradesh". Second, I am not aware of the details you mentioned. China and India have established a mature management mechanism for border-related issues, and the two sides can handle various border affairs through relevant mechanism. Third, upholding peace and tranquility in China-India border areas serves the common interests of both sides. Q: The Washington Free Beacon on January 2 reported that after the DPRK's sixth nuclear test in September, 2017, the Communist Party of China decided that it would offer greater economic and military aids to the DPRK and not allow Kim Jung-on's regime to collapse if the DPRK stopped further nuclear tests. Is that report true? A: In a word, fake news. Q: The above-mentioned incident took place just around the same time that China and India held the 20th round of border talks. Are we looking at another standoff between the two sides? A: With the concerted efforts of both sides, the incident that took place in Donglang last year has been peacefully resolved. Besides, at the end of last year, the two sides held the 20th round of special representatives' meeting on the boundary issue and sent out positive message to the outside world. We hope the two sides can maintain the positive momentum in growing China-India relations and jointly uphold peace and tranquility in the border areas. Like what I said, this is in the interests of both countries. Q: According to reports, on January 2, the US Ambassador to the United Nations Nikki Haley spoke in support of the anti-government protests in Iran. She denied the Iranian government's accusation that the US has been behind the protests, adding that the US is seeking an emergency Security Council meeting in the United Nations Security Council and the Human Rights Council in Geneva regarding Iran. What is China's stance on this? A: As I said yesterday, China hopes that Iran will maintain stability and achieve development. Q: According to reports, the US government rejected China Ant Financial Services' acquisition of the US MoneyGram on the ground of concerns over its citizens' data safety. What is your comment? A: We have said multiple times that China-US economic and trade cooperation is mutually beneficial and win-win in nature. The Chinese government always encourages Chinese enterprises to conduct outward investment and cooperation in accordance with market principles and on the basis of abiding by the local laws and regulations. Meanwhile, we also hope the US will provide a fair and predictable environment for the Chinese enterprises to invest and develop there. We are willing to further advance China-US economic and trade cooperation in the spirit of mutual respect and win-win cooperation. This serves the interests of both countries and peoples. Q: The report of the Washington Free Beacon on January 2 was allegedly based on a leaked document from the General Office of the Central Committee of the Communist Party of China. Is this document true? What's your comment? A: In a word, fake document. Any person with even a modicum of common sense can tell that is a fabrication. Q: According to US think tank Eurasia Group, the world in 2018 will continue to enter a period of geopolitical depression, and China's move to fill a power vacuum left by the United States will be the top risk for 2018. what's your response to this? A: Like we said on multiple occasions, as a principle, we usually don't respond to the opinions or views of experts, scholars, media or think tanks specifically. I would like to point out that the 19th National Congress of the Communist Party of China has set an overall objective for China's diplomacy for the new era, namely, promoting the building of a new type of international relations and a community with shared future for mankind. We follow an outlook on global governance that features wide consultation, joint contribution and shared benefits. In terms of international affairs, we has no intention to either lead or replace anyone.